You don’t have to wait for the New Year to start a new fitness regimen. You can start integrating healthy habits before the hype of weight loss in January. Healthy lifestyles affect various aspects of your life. By making a positive lifestyle change you can see benefits emotionally, physically, spiritually and even with your relationships on an individual level as well as with your family. 1. Exercise improves your mood & increases self-esteem. Regular physical activity can help you prevent — or manage — high blood pressure. Your cholesterol will benefit, too. Regular physical activity boosts high-density lipoprotein (HDL), or “good,” cholesterol while decreasing triglycerides. This one-two punch keeps your blood flowing smoothly by lowering the buildup of plaques in your arteries. Regular physical activity can help you prevent Type II diabetes, osteoporosis and certain types of cancer. When you engage in physical activity, you burn calories. The more intense the activity, the more calories you burn — and the easier it is to keep your weight under control. Dedicated workouts are great, but physical activity you accumulate throughout the day helps you burn calories, too. Winded by grocery shopping or household chores? Regular physical activity can leave you breathing easier. Regular physical activity helps your entire cardiovascular system — the circulation of blood through your heart and blood vessels — work more efficiently. When your heart and lungs work more efficiently, you’ll have more energy to do the things you enjoy. 6. Exercise can be fun! Physical activity doesn’t have to be drudgery. Take a ballroom dancing class. Check out a local climbing wall or hiking trail. Push your kids on the swings or climb with them on the jungle gym. 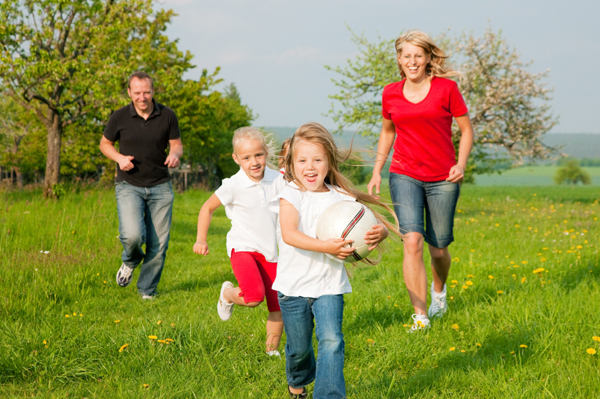 Plan a neighborhood kickball or touch football game. Find a physical activity you enjoy and go for it. If you get bored, try something new. If you’re moving, it counts! 7. Exercise increases mental focus. Did you know that the latest research shows that exercise helps keep the brain sharp well into old age? Anything that involves mental acuity (focus and concentration) is improved. You also stand a much better chance of avoiding such diseases as Alzheimer’s and senility. 8. Exercise improves your relationships with others. It provides you with an outlet for your stress, allowing you to be more relaxed and able to focus more on others. If you exercise with a partner or family member, it provides a perfect opportunity to improve communication and strengthen your bond by committing to doing something together. 9. Exercise can decrease stress levels. The worries and stresses of everyday living (commuting, work demands, conflicts etc.) can stick with you long after the work day is done. Exercise right after work is the perfect natural therapy that can change your mood. You’ll sleep better too! Find a partner or class to be accountable to – spouse, fellow pastor, friend, child, anyone….. It is good for us to teach these healthy choices to our children as well. By setting an example for our children, we encourage them to embrace healthy habits from a young age and help to increase their brain development, decrease their risk of obesity and other childhood diseases, improve their self-esteem and spend more time together as a family. Decide HOW & WHEN you will exercise – make a written plan and schedule it in your calendar. Don’t break that appointment with yourself. I would encourage you to track your exercise – set a goal of 30 minutes a day/three days a week or three family walks a week or a certain number of steps on your pedometer – anything that you enjoy – then record it on your calendar just like all your other appointments. When you finish, write it down so you can see your progress – you can use a calendar, a sheet of paper or a website. Sparkpeople.com allows you to track food and exercise – you can use it for either one. There are also lots of articles, workouts and recipes you can use.